Good news! My bathroom floor is level! The house leveling company was able to send two guys out earlier than they had anticipated. Two guys…30 minutes…done. So that means that I can now resume work on the bathroom. My plumber thinks he may be able to work me into his schedule today, so if that’s the case, things will be really moving along! I had narrowed it down to two options — both of which I saw on TV shows, and I can’t remember specifically where I saw either one. The first option is a 1-lite French door with a raised panel below the glass. I still want my interior doors to be black, and most definitely not rustic or distressed, but this is the closest example I could find. Of course, I would add frosted privacy film to the glass since these doors would be used on bedrooms and bathrooms. And even though one layer of privacy film is enough to give full privacy, I’d add the film to both sides of the glass just for additional peace of mind. The other style is a very simple single panel door with a double frame of moulding. I couldn’t find an exact example, so I did a little photo editing on this single panel door from Home Depot. And again, it would be black. The picture kind of makes each section look recessed, but if I go with this look, I’d just use flat doors and add two frames of moulding to create a similar look. It’s a very simple and elegant look in black. So after giving it quite a bit of thought, I finally decided on the glass doors with privacy glass. The fact is, I’ve been dreaming about having interior doors with glass for many years now. I even blogged about it way back in 2009 (and a couple of times since then), shortly after I saw Kevin and Layla at The Lettered Cottage put glass in their guest bathroom door in their last house. I wanted to do something similar in the condo. That didn’t pan out, so I decided that now is my chance. But then this past weekend, I was telling my mom all about my plans for my bathroom. I described the door, and when I mentioned glass, she said, “On the bathroom? !” I explained that I would use not just one, but two layers of privacy film. She still wasn’t convinced. So, once and for all, I want your input on this issue. Would you feel comfortable using a bathroom in someone else’s home that had glass in the door with two layers of privacy film? And just for reference, here is a picture from the very first room where I used the privacy film several years ago. It was a bathroom, and the tub was located just under the window. I waited until it got very dark outside, put a ladder in the tub, and turned on all of the bathroom lights (including those two very bright recessed lights by the tub). And again, that’s with one layer of privacy film. I plan to use two layers on my interior doors if I use the glass doors. I’m so confident in the privacy film that I used it on our bedroom window at the condo — a first floor (i.e., ground floor) window that looked out to a busy parking lot. I kept the shade up all time, even at night with the bedroom light on, because the privacy film really is private. And on that window, I just used one layer. And two more thoughts: (1) The toilet in my hallway bathroom isn’t right by the door. It’s in the back left corner, and (2) it’s very unlikely that people would be hanging out in the hallway while someone is in the bathroom. Who hangs out in a hallway? So tell me your thoughts. I really had my heart set on this design, not just for the bathroom, but for the bedrooms also, especially after enjoying the privacy that my rolling doors give me while still letting light through. I’ve seen French doors used as bedroom doors and bathroom doors, and it’s beautiful. And yet the thought seems to make some people feel like they’d be on display no matter how frosted and private the glass is. What can I do to have my way and have glass interior doors, and make guests feel comfortable with the idea? Any thoughts? As a guest, I’d be fine with it if I looked down the hallway and saw that all the doors were the frosted type. If it was just the bathroom, I’d feel pretty awkward / on display. Sound will travel easier through the glass doors than a regular solid-core door, though. I agree sounds will travel…. My sister had a similar door (half glass/half wood) in her last house. She used a glass etching kit to frost the glass. It was the only bathroom and they had tons of company all of the time. The toilet was on the wall opposite of the door (like yours). It was fine and worked out well. You couldn’t see anything. I do think that it was less soundproof that a solid wood door though (if you like to sing in the shower or blow dry your hair at 4 am). I really like your choice. It would make the hall lighter and brighter. Very pretty! The privacy film for sure! What a great look and it does still offer complete privacy. Also, as a side, the film on both sides will offer added reinforcement for the glass. Win and win! That is what I bought for my bathroom. It is already venitian frosted though but that is only because I got the door on a sale lot for 65$ (instead of 150$). I already bought the frosty paper to out on the windows (silly people put one window bahind the toilet, the other IN the bath). I think you should do what YOU have wanted to do for years. Your house, your dreams. Sorry, but I would have to vote for the solid doors. It may just be psychological, but I would feel weird sleeping or sitting on the toilet with a glass door. My parents have frosted glass windows in their bathrooms and they ended up hanging window treatments over them for the very same reason…my mom felt “exposed” when she got out of the shower. I’m afraid I vote for the solid door, too. I just think it would look more beautiful than glass doors. It would look a little weird, frankly. Guess I don’t get the glass door for a bedroom or bathroom concept. (Also the sliding barn door looks for those two rooms). I want privacy, and I wouldn’t want guests to be uncomfortable. But maybe I am the voice in the wilderness on this issue. I’m with you. I just don’t get it. I’m for the solid doors. Me neither….but maybe I’m out of touch with decor trends?? maybe save money on the doors and spend it somewhere more visible? I agree. As a guest, I would feel very uncomfortable not knowing if anyone could see through the glass. I also would not like the fact that sounds pass through glass more than through solid wood doors. I have to agree about the glass in the doors…I don’t care for the idea of them either; the one above looks cottagey to me, and although I love the cottage look/feel, I would use that door to a laundry room or pantry, but never a bath or a bedroom. Your decor style is so elegant, I think solid, black doors would look smashing in your home. But with that said, it IS your home so go with your heart! I just don’t think I could bring myself to use a bathroom door with glass, No matter how opaque the film was. The only place I might consider using a door with glass in my own home would probably be on a pantry or laundry room. I think the second option would be so elegant in your home. Your bathroom, your design, your choice! I LOVE the idea of the glass interior doors, even the door to the bathroom. It will be stunning! I hope you will do what you want. It is your space. If you have a guest who is squeamish, so demonstrate that it is totally private, but never give up your design dream for a guest, who may only come once or twice. I am just picking out the frosted glass doors for my living space in my daughter’s basement, and I am going to love having light that can be seen while I maintain my privacy from the family room. I like the glass doors with the privacy film. I’m thinking that solid black doors will look “heavy” and dark. I’m sure either will look amazing, though. Also, please be warned that noise carries, especially from a bathroom, with all those tiled and hard surfaces! Like you, however, my bathroom is not directly off a “public” room, so it’s not much of an issue. 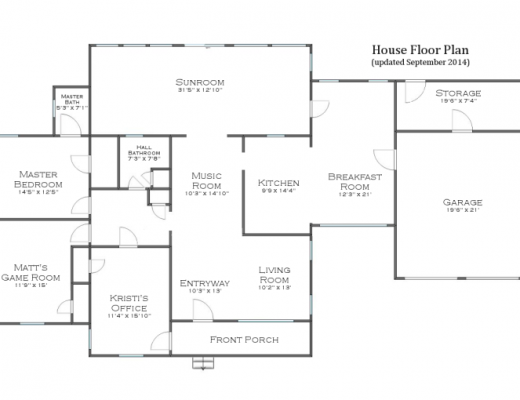 What if you did glass windows on the bedrooms and solid door for the bathroom? I feel like they compliment each other. I would be anxious the entire time in a glass bathroom like that. I agree. The best of both worlds. I love the idea of the glass doors and if I was in my forever home I would do it too. There will be people who find it strange, but it is your house and if it makes you happy go for it. I would say though that I don’t think all your interior door have to match. Having 1 or 2 different may be more interesting than everything the same – since you want them all black that is the unifying characteristic. I am in agreement with lot of the other comments above. I absolutely love the look of it; but psychologically I would know its a window, and just be really uncomfortable. I like the idea for a pantry, laundry room, etc, where you wouldn’t have to wry about anybody’s privacy. A good friend has a frosted glass door on her bathroom and I feel so exposed and uncomfortable using it, I now use another bathroom in her home. I am going to have to vote for a solid door on the bathroom. I agree, a friend of mine also had a glass door for her bathroom and I always felt that I was on display! Hated that. I agree – the glass door would make me feel uncomfortable, but I do like the way it looks. Why do all the doors have to be exactly the same in that hallway? Why can’t they coordinate — same color, same style, some with glass and some without? I think rows of matching doors look institutional. My own preference would be to go with the glass, especially because that bathroom won’t have a window (if I remember correctly). I am all about maximizing light. And I’ve lived in a lot of old buildings where the bathroom is an afterthought and the toilet and the window have too close a relationship (usually draft, too) — so I’ve gotten used to it. People who visit you frequently would also get used to it. So I guess the question is, are you willing to make them get used to it? I like the idea of putting glass in doors, I would however limit the amount of glass. Here in Belgium, it is totally normal to have glass in bedroom and bathroom doors, of course with frosted glass (I would not use film). I would post a picture of the kind of door I mean, but can’t over here. I will stick one on your FB page. Love reading your different progress reports. That privacy glass looks grey in the picture. 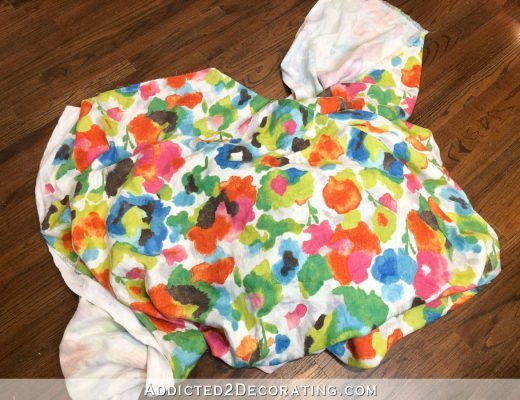 If that’s the case, I would have to say no if it doesn’t blend with the colors you pick throughout the house. Yes!!!! I love love love it!! I vote solid doors. I would worry about people seeing my silhouette and movements through the glass, no matter what room I was in. There are doors made with small glass panels that run along the top of the door that could work. It might be too much of a cottage or craftsman style though. Yes, that was my thought…the silhouette and especially movements behind a glass door, along with the sound factor. What about a solid black wood door with a narrow pane of frosted glass at the top, like a transom? Yes it is the silhouette that would bother me; and the shadows and the noise to boot. Guess I am old fashioned but no glass doors. As your guest, I would want a solid door on bathroom. If I stayed the night, I would prefer one on the bedroom I was sleeping in. It’s a sound thing for me as I would know no one could see me. Now my question to you is, how often do you actually have guests? Are they the same people that always come over because they would get used to it, especially since your hallway isn’t heavily traveled or open to main part of house. Lastly, I say do what YOU prefer and I do think glass will break up the darkness of black doors. My bathroom has a solid door but a transom window at the top. We have to keep the window closed and turn the fan on to give guests the privacy we need when they use the restroom. It works but it is a little awkward so many guests use our second guest bath. Something to think about. Hi K! I really think a proper use of the frosted glass doors would be on a bathroom door off a master bedroom. Personally, the doors remind of me of the bathroom doors of some restaurant bathrooms. I’d use the room if I was at your house, but I’d never be comfortable doing it. I understand you’re trying to bring some light into the hallways, and bedrooms, but I think it would be more elegant if the doors were the solid ones you’re proposing. You need to go with the frosted door! Love the look! I would feel, and have felt, very self conscious using a bathroom with privacy glass door…no matter how opaque. The bathroom is one room where I want full privacy. You may know that it is fully opaque, but your guests wouldn’t. I wouldn’t mind it for the bedroom door though. I wouldn’t think twice about using a bathroom with a frosted door like that. It will also break up the heavy black a bit as others said. I do think light from the hallway could be an issue on glassed bedroom doors, though. But i like to fall asleep in total darkness, so that could just be a personal thing. If you guys aren’t sensitive to the light, then go for it! Although I love the look of a glass door (it also adds the benefit of light travelling through windows to brighten up your hallway), honestly I still feel that I would be hesitant to use a guest bathroom with a frosted window. I know that you are adding 2 privacy films, but as a guest, you wouldn’t necessarily know exactly how private that is? I love the added elegance of the full wood panel door, much less “cottagey” for your design style (based on the elegance of your kitchen). BTW I too follow The Lettered Cottage!! LOVE their designs! Hafta’ vote with your Mom on this one . . its the silhouette/shadow on the frosted glass I’d be self-conscious about not to mention the sound carrying through glass much more than a solid door. I agree with the post that suggested the frosted glass door on your future Master bath. As to light . .I wonder how much light will the frosted glass would capture from an interior hall anyway? Also agree that all interior doors needn’t be identical so long as they share a similar design. I think making all the interior doors glass door is an over kill of a good thing. I think they are great on the pantry/laundry room/den but the whole house seems to be too much. However, with that being said… it is your house and I can’t wait to see what you do. I love the solid doors you have in option 2. I would feel exposed with glass doors. I’m not sure looking at privacy film is a good look for my taste. To me it would look like you are using the film to cover up an old door that you didn’t want to replace and don’t really want to see through. In saying that though, you should do what makes you happy in your home, that’s why we all tune in. If you’re looking for opinions, I would want solid doors and the style you have shown would look beautiful. Although using a bathroom with a frosted glass panel would not bother me I would be concerned about how you would clean it with the film on both sides of the glass? We have frosted film on one side of a cabinet in our home (the inner side of the cabinet doors) so the outer part is still glass which can be cleaned with windex or other. I don’t think cleaning the Gila film would be very easy. I suppose it might be inexpensive enough to just cut a new piece anytime it gets really gunky but a bit of a hassle. The frosted glass door just doesn’t sing to me. I prefer the solid door style for the look you are going for with the rest of your house. As you look at the door from the outer rooms, how many other doors are in your site line at one time? I’m not sure on either choice you’re proposing. To me the door with the top glass and bottom panel looks like an exterior farmhouse door. And the thought of a whole hallway with solid panel doors painted black seems like a trip down a light-sucking tunnel. It will be interesting to see what you ultimately come up with since I haven’t yet painted my hallway doors. Personally a glass door would not affect me one bit and the glass door you’ve chosen is a nice looking door but I think the solid wood door is better looking and keeps with the rest of the look of your home. Someone mentioned a glass door on the pantry and it would probably look good there. As a guest, if I hadn’t tested the door myself I wouldn’t feel comfortable at all. I probably wouldn’t feel comfortable even if I had tested it, because not all conditions are equal. I would only feel comfortable as an owner after having done many tests. Speaking of which, your test shot seems invalid to me. It’s not seeing the interior that’s the problem, cause you can’t, it’s shadows that are the problem. And here there are two problems – first, you didn’t have a big object next to the window (as when someone would be using the tub), and second, I think that the light AFTER the object casting the shadow (i.e. the window spotlights) would destroy the shadow, not increase the likelihood of it being visible. I love the idea Kristi. It will look beautiful and let in a glow of light. You’re brilliant! Sorry, but no go on the glass bathroom door. Glass is not going to muffle sound as well as a solid door. If it was a private on suite bathroom that might be different. Solid door, all the way. I’m also having trouble envisioning a whole hallway of frosted panel doors. Won’t that look like an old school building (obviously on a smaller level)? I think often those of us who love home decor and home design end up having “pretty” houses that sometimes aren’t creating an environment that makes guests to our home feel relaxed and comfortable. More than my home being beautiful, I want my home to be an extension of myself. Being a comfortable, welcoming, and safe place is my #1. I would never feel comfortable visiting a family member/friend and using the shower in a restroom with glass doors. They do not physically have to watch me for me to feel exposed. No one enjoys feeling that way! The sounds carry! I would go for the frosted glass panel. It is your house, and you will have to live with the door design everyday. If you go with something else only because of your guest’s concerns, you may grow to dislike the design choice. I am not sure how much space you have available behind the door, but you might be able to add a little pull down shade or something on the bathroom side of the door for guests to pull down if they still feel uncomfortable with the frosted glass. But I may just be partial to the glass panel idea. I have glass panels on three exterior doors of my 1957 ranch style house, and the privacy film works great on them. I wouldn’t have a problem with the glass door, and as for sound travel, you could do as someone suggested to me when we were building. A salesman suggested in our powder room located next to the common area, to use the standard vent fan, not the uber quiet ones. That gives guests the comfort of knowing no embarrassing sounds can be heard through your glass door. However, in your case, this is your main floor bath, that you will be using for several years until you do the big remodel. You will have to listen to a loud fan when showering, getting ready, etc. It is a good option for guests, but something to consider for personal use. Good luck! For extra light why not put in a sun tunnel? Initially I liked the idea of the glass doors, but it then made me think of Julia and Joel’s house on Parenthood. I always thought the glass doors they had on every door upstairs was strange, and didn’t look like it was very private, even though those glass doors were probably made with actual privacy glass, not just film. I frequent a restaurant that has frosted doors on the bathrooms. The first time I was hesitant but when I saw how you couldn’t see anything, I got over it after the first time. It’s definitely mind over matter. If putting two layers of film on it makes it look solid, than I think it defeats the purpose. If it were right off of a main room than I could see more of a hesitation for guest’s piece of mind, but that’s not the case. I say go for it. I am surprised at how many nays you received. Traci at Beneath My Heart had a better response. See her post here: http://www.beneathmyheart.net/2013/03/antique-bathroom-door-makeover/ I say go with your gut. I don’t like the frosted glass doors on the bedrooms or bathrooms. I wouldn’t put them in my house, and I’d feel uncomfortable visiting/staying in a house that had them. In the bathroom, my concern is less with sight and more with sound proofing. I’d also be annoyed in the bedroom that you could see when the light was on inside or outside of the bedroom, even with lots of privacy film. It just wouldn’t seem very relaxing to me. Now the other two bedrooms I believe you’re using as an office and game room – those would be totally fine with me to use the glass. Granted, the way the hallway is set up all of these doors are less open to any living areas so these effects are somewhat negated, but I still would think it was really weird. Black solid doors with the molding get my vote. I do think you could easily mix glass with solid. On the solid, when you do your molding, just make it the same dimensions as the glass is. So then it looks like the same door, just with a solid inset instead of glass. This is also a good alternative, to put glass doors instead on the office and game room. The glass doors would be my choice because of the black. The glass would break up the block of black & make it far more interesting. It seems far more creepy to me to have anyone in my house who would look thru the door to watch someone on the toilet or in the bedroom. Etching on one side of the glass & film on the other may be an option, too. Solid door is my vote! I know you previously posted about wanting additional sound insulation for the bathroom. I don’t really see the point of going to that additional expense and then using a glass door. That combo seems very counter productive to me. I think the solid black doors would add more drama and look great with your decor. If everything is a focal point then nothing is. Hi, my in-laws put a glass door as their bathroom door. It’s been a few years and has worked out great. My mother in law was the one who wanted it and my father in law was afraid the frosting would not offer enough privacy. You can’t see a thing! When they first had it installed my MIL would stand outside the door while my FIL was using the bathroom and say “I see you!”. Too funny! He did not share that thought though! Good luck deciding. Couple of thoughts – first, it’s your house so why not go for it and just see how you end up liking it? One new door won’t necessarily break the bank if you decide it wasn’t right – or you can use it elsewhere. Also – I agree that having a mix of doors is ok – some glass, some solid. I like how Layla at The Lettered Cottage used an antique door for the entrance to their bedroom hallway in their new house. I’ve bought an old door similar to the first one you show with the intention of using it as our master bedroom door. See our bedroom is on the main floor at the end of a very short hallway off the kitchen/main living area. We often close it during the day for various reasons – keep the dog out, hide the unmade bed or unfolded laundry on the floor if gets appear suddenly 😉 ! But then that hallway is so dark. That tiny bedroom ends up bringing in a lot of light if the door is open.So we thought perhaps doing a fun old door in a fun color, with frosted (heavily) glass would help let light through. Haven’t worked on it yet. I say go for the frosted door for one door – bathroom if you wish – and solid for others and see how you like it. Or glass for all – it’s your house! Glass doors are pretty and I like them used to close off a Music room or formal living room. If you have to add the privacy film isn’t that defeating the whole purpose of having a glass panel in the first place? Personally I would feel very uncomfortable using a bathroom with a glass door…heck even when I use my daughter’s guest bath with a window I’m pretty freaked out! I too like a total dark room for sleeping and the slightest light will keep me awake, but that is just me. It is your house and you should do what you like. Just know before hand that some people will not agree with your choice no matter what you choose and be okay with it. I love most of your choices and find them all interesting to consider. Can’t wait to see what you decide to do next! Another issue to consider: How often do you have guests? Are they mostly family? I remember that old post! I wouldn’t mind the glass in the bathroom door, but am not so sure about the bedroom door. I am totally convinced , though, that mixing both type of doors is ok and might even add interest. love the colour choice – black doors rock! I have 5 light glass doors on all my rooms upstairs (bedrooms and bathroom). They have what’s called “reeded” glass, which is a very fine texture. It allows light to pass through but as for seeing what’s going on inside the room – nope. 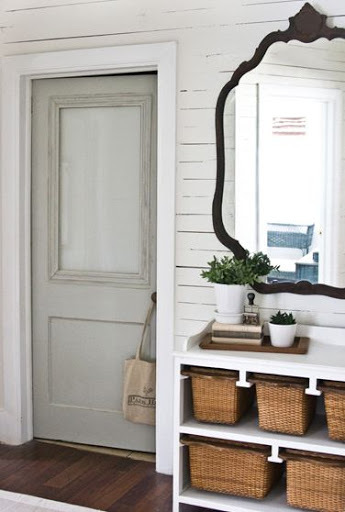 The only reason I don’t have something similar on my powder room on the main floor is because it is in the entryway and the door faces my entry door. You still wouldn’t be able to see through it but I just want that extra level of privacy because of the location of the room. I say go for it – your bathroom is in a hallway. This is what I would like to do in my hallway, but can’t pull the trigger to cut out the space above my doors. If I had a nice tutorial by an awesome blogger, it would make my project so much easier. Lol. Not selfish at all here. I love the look of the glass door, especially with words painted or etched on it, but I have to say that as a guest I would be a little hesitant to use someone’s bathroom with a glass door. In my own home I wouldn’t have a problem with it at all. Maybe you could use a curtain on the inside that could be drawn over for your more timid guests. I like the idea of having some frosted glass window/doors in your hallway. It will definately brighten up your hallway. As for the privacy issue, I would think that two layers of frosting will keep it pretty private. It’s your house, but I vote no on the glass door and film. I used it on a bathroom door in our basement and found when our guests left they had thrown a towel over the glass so obviously they didn’t feel comfortable. Also, the film looks ugly to me. I prefer the wooden doors. That said, if you do go with glass, you might want to see how much it would be to order them with privacy glass already in them (these are going to be special order anyway). It’ll save you time and maybe extra money. You also have different choices than just the foggy look. If you want to DIY it, you might consider Etching Cream. it’s sold in craft stores and is typically used to stencil patterns onto drinking glasses. It’s an acid cream that actually eats away at the glass, leaving that foggy look once it’s rinsed off. Might be cheaper or easier than the plastic. Might not. You could have fun stenciling a design onto the glass too if you so chose. One last thing to consider… You were worried about sound earlier. Is glass going to give you enough soundproofing for the bathroom? What would your mom say if you went with the paneled look, but inset film-covered mirrors into the top section? It would be a sneaky way to get both sound proofing and an airy feel. More work and materials though. I love the glass doors and I really hope you go for it! What if you put a cute little curtain on the inside of door so someone could close it – even though they wouldn’t need it, it seems to add that additional level of perceived privacy. Also, it’s only visible from the inside of the bathroom when the door is closed, not visible from the hallway? I agree that you would get the necessary privacy with the glass door and privacy film, but I would install a solid door because of light. I personally cannot sleep with any lights on, so if the hall light was on or if it was a nap during the day, that would interfere. I recently updated my 50 year old interior doors…. They are hollow core and i just bought picture frame moulding and glued it on, then painted the doors black. My exterior doors are french doors, so i just mimicked the look with one “panel”. It turned out great! And since I didn’t change the thickness of the door, I didn’t have to adjust the door jambs or hinges. Personally I think that the glass doors would look better, breaking up the black, adding light, etc., but I would be terribly uncomfortable in both the bathroom and the bedroom, particularly as a guest but even as the homeowner on some occasions. For example, it’s rare but sometimes when I’m home alone I hear a strange noise, especially at night, and get a tad nervous. I usually need a minute to compose myself and remind myself that likelyhood of someone being in my house is basically nill, and then go walk through the house calmly. However the knowledge that theoretically someone could be on the other side of the door watching, even just my faint silhouette, and knowing when I was headed for the door would be extremely unnerving to me. Also, what if you have guests that stay for a while and either you or them decide to partake in a little make-out session with the hubby (ah, your respective hubbys obviously 😉 )- even faint silhouettes can feel like venturing into exhibitionism. Or like others have said- the sound factor in the bathrooms, combined with even faint, blobby silhouettes. If you’re having bathroom issues then you already have to deal with it being obvious because you’ve been in there so long, disturbing noises, or the dead-giveaway fan running, but then you hear someone walking past and pray that your blobby silhouette is blobby enough that they can’t tell you’re still on the toilet. I’d totally use it! and I’m loving this idea. May use this idea in my house b/c my hallway has a lot of doors but no natural light and this would be a way to light up the hallways with the excess light from the rooms. Fantastic idea!!! I know this probably isn’t anything you would consider, but I would use glass doors for the hallway and a solid one for the bathroom. But on the hallway side of the bathroom door I would paint it trompe l’oeil to make it look just like the other glass doors. As in other comments, it is more the sound factor for me. It just feels revealing. Even if you knew with absolute certainty that the sound muffling was even better with your glass door than with a solid door, as your guest I would still feel, um, inhibited while in the bathroom. Besides, I really love the second option – so classy and elegant. Whatever you choose will be lovely, though. I wouldn’t feel comfortable using a door with glass even with the privacy film, seems like you could still see shadows moving around. I do love the doors that are out now that is still squared at the top, but has a small arch, it is a paneled door. I love the diversity of opinions. I agree with those who feel a bit freaked out by the silhouette & sound factor in a bathroom door with glass, regardless of how frosted or opaque it is. My personal preference would be solid wood. I really love the idea of frosted glass doors, but the reality kinda gives me the willies. Sorry! Have you considered tubular skylights to bring in natural light? I have two. One in the bathroom and one in my office (no windows in either room). You could even do one in the hall. The skylights would provide much-needed natural light in an area with several black doors, and your guests would feel they had true privacy when they’re doing their private stuff. Like pooping. Everybody has to do it, but nobody wants to feel they’re being seen/heard/smelled while they’re doing it. 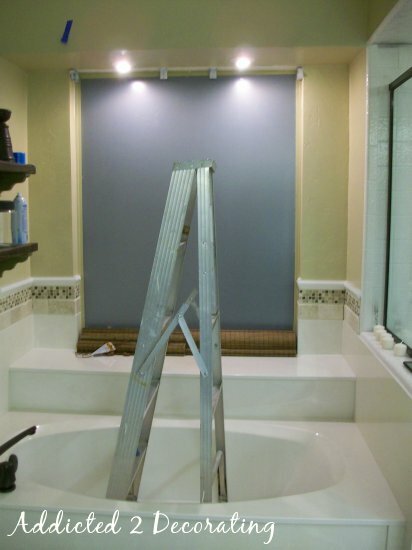 Genevieve Gorder did something similar in her “guest” bath in a recent show ‘Genevieve’s Renovation’. I think it’s actually quite nice. Once you realize that where the door would be in relation to the light fixtures and that the toilet is on the opposite side and also the shower/bath is on the other end as well. I can see how someone might get nervous coming out of the shower and feeling silhouetted. It’s your home do what you love and are happiest with. It’s a smaller bathroom with no windows, the glass in the door should add a nice feeling to the room. Enjoy! love the glass doors and would definitely use them. I’m in the process of replacing the hollow core doors of bedrooms and bathrooms with solid core ones, for sound privacy. Personally I would never put a glass door in a bathroom for fear that all the toilet-related sounds would be heard clearly from outside. 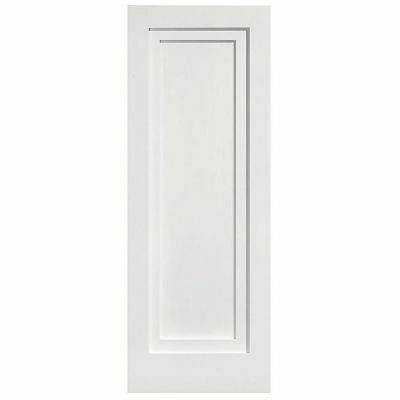 In regards with your second (losing) option, single panel door with two layers of trim, please be aware that the usual doorknobs and door handles can be mounted on doors that are 1 3/8″- 1 3/4″ thick, and the standard panel doors are already built at one of these dimension. Therefore if you add trim on them, you have to design it around the mounting hole of the doorknobs. Otherwise, I like the aesthetics of both your options. oh gosh – perhaps it’s a generational thing (although I THINK I’m probably somewhere in-between you and your mother’s age) – but I would be SO uncomfortable using a bathroom with a glass window (no matter HOW much opaque film). I DO however like the idea – just for different rooms. i think this comes down to whatever you want. If this is what you really want and you know if will make you happy then go for it. Yeah some people might come over and not like it, but they don’t live there. For me, it is not. I kind of look at a glass door and wonder the point of having to cover up all that glass! I also get that some people will always feel exposed even though they really aren’t. But, you live there, not other people. Yup sometimes you have to go to other people’s houses and not feel 100% happy with their stuff, but it doesn’t matter because it is not yours. We have a small window in our guest bath with privacy film. Because the guest bath is in the center of the house, away from any exterior walls that would allow natural light from outside, the window “looks” into our master bath and allows light in from a large exterior window in there. The only way you can “see” through the privacy film is if someone puts their hand directly on the glass from the other side. Then you can see a shadow of their hand. This privacy issue isn’t with what you can see, but what you can hear. My kids like to use the guest bath when they know I am in the master bath so they can yell “Mommy, I can hear you peeing when I am peeing!”. I would not feel comfortable using a bathroom in someone else’s house if the door was made primarily out of glass, regardless of how little you could see through it. I think adding too many glass doors in the space of a hallway will make it look busy. Even though you won’t see the exact features of the person you will be able to tell where in the bathroom the person is and it is a psychological thing on the privacy part. I think the only way for people to feel comfortable is to actually see it for themselves. Without that there will always be some part that feels uncomfortable. I also think when you can see the doors and through the opening into the hallway and then also see your barn doors the styles would compete somewhat and be less unified looking than if you went with the solid ones that seem to be a perfect complement to your barn doors. If they both weren’t visible from the same point I would suggest just game room or office for glass doors, but being that you could stand in a spot and see both it ends up too much of a good thing to me. PS: What would that last shot look like if the ladder were replaced with a human? i.e., the ladder is light colored, and I think is helped by the fact that it’s shiny and reflects the light. You nailed it!!! As Americans you’d think we’d all have more important things to obsess about instead of worrying if someone hears us fart!!! My parents’ guest bathroom door is directly across the hall from their office (similar to Kristi’s, I think) and also adjacent to the breakfast nook. It’s not so much about being prudish or not wanting people to know you fart, but from the listener’s perspective it is a little awkward to hear someone’s toilet sounds while you’re working on the computer or eating a snack. In public restrooms, you’re all there to take care of bathroom business. In a home, it is different situation. My mom has a bathroom with a half glass door and I hate it. Obviously, it is frosted privacy glass, but it doesn’t matter what I am doing in the bathroom I always feel exposed to the world. It’s always very uncomfortable going to the restroom or taking a shower or even brushing my teeth for that matter. I would totally vote for a solid door. I would also be more concerned about the sound. I hate loud bathroom vent fans but when I replaced the one in our guest bath I opted for another loud one for privacy. I also am thinking the having the two material (wood and glass) on all the doors might look busy rather than having all wood. These are the kind of decisions that impair me and then I am just in a holding pattern until I make up my mind. It took me a year and half to decide to leave our doors walnut stained wood rather than painting them. I am happy with the decision I finally made. Go for the glass! Personally I love the idea. It might take some more money to replace the door if you decide it’s not something you like after all, but I think it’s more important to take risks. You’ve said you like this design for years. Do it! * Using the glass doors on other doors and then using moulding design similar to the glass doors on a solid door for the bathroom. If glass door is what you want…go for it! As a guest, I wouldn’t think twice about using a bathroom with frosted glass. I would be VERY uneasy if I visited a home where the only bathroom had a glass door of any kind, or even with privacy film on both sides of the glass. Shadows of movement, however frosted, still look like a moving human figure. Go with the glass doors….it’s your house and you have great taste. I’m sure the doors will work just fine. Before I bought my new front door, I had a 70’s style half length light with obscured glass. I wasn’t sure it was obscured enough, so I added frosted film. When I friend came to the door, I wasn’t ready, so I grabbed a coat to cover up and opened the door, only to be told that he liked my red slip. Oops. I don’t know whether obscured lights are enough to ensure privacy, but I think I might be uncomfortable with one in a hall bathroom. I also agree with responders who said the number of door involved might look too busy. You’ve done such a lovely job on the special doors you’ve made, you might want to consider a simpler idea for “ordinary” doors and save your wonderful creativity for other flourishes. I have glass doors on every room in the house and LOVE it – I of course have etched the glass. I LOVE how the light filters from room to room – I would do it again in any house I live in!!!! I actually lived with this before and hated it. You never felt like you had any privacy. The main problems Will be sound and light shining through the door at night. Imagine being a guest who has to go at night or take a small child at night and having to light the whole hall up at 3am. I would suggest doing a clear door on the little bath closet and/ or any little hall closets. Not the bathroom or bedrooms. I really think you would hate it even though it would look nice. My advice would be not to do it. If it were my choices in my home.. I love the glass window in the black door. The contrast of the light with the dark is very architectural and a great feature. As for the feeling of privacy, well give it a test run. Buy the one door for the bathroom. If you don’t like it after it is hung, you can always change it to the other later down the road. Most of the time it is you and Matt. When you do have company over, you might want to have a vent fan that runs with the light switch to provide that sound masking effect as well as ventilation for odors and moisture. If you don’t like that idea then perhaps one of those ambient noise makers with white noise on a shelf somewhere. Where else can you have the freedom to do exactly like you want than your own home. The question is this, what does Matt think of the idea? Kristi, you are GENIUS!!! I love this! I think it is perfect and for the guest bath as well! You can always put a decorative pull down shade on the inside of the bath if anyone feels uncomfortable. Europeans do this all the time, no one freaks out over it. Think of all the light you’ll be able to share from room to room. We had glass block in a window over a tub/shower. People said the same thing about that (ooh, I just couldn’t) but any images from inside were so chopped up you’d never be able to see anything outside. And the light was great. Go for it, Kristi! Start something wonderful! Noooo. Too industrial and trying to hard to be unique in the wrong place. I pretty much love everything you do, but I agree with your Mom on this one. Love your idea ….glass door. Just a thought, maybe put toilet in black vinyl or paint. Great idea!! As most everyone else has said…it is your house and you should do what you want. I have read your blog for a very long time and know that if you don’t like it, you will change it. My only concern with a glass door that comes down so far, is having a husband in a wheelchair. I don’t know if that would be an issue with his safety, if he accidentally backed into it while turning around in the hall or would he always feel like a bull in a china shop. My vote is the solid doors with the simple molding trim. I think that looks very elegant. Glass doors to the bedrooms and bathroom might look good, but how would they function? I too would feel uncomfortable using a bathroom with glass doors, but it’s not likely I’ll ever have the opportunity to visit! If you do decide to do the glass doors and it doesn’t function as you want, you can always put sheers or blinds on them. 1) I love it. I’ve been in hotels and restaurants all over the country that use frosted doors and have never thought twice about it. 2) If you are using a vanity for the sink, there’d be a sort of ½ wall anyway between the door and toilet. 3) Way too far from the toilet to make a difference. Only question is, how vulnerable would the doors be to breakage due to Matt’s wheelchair? I’ve seen homes with the most agile chair users with gouges in places. I would say the glass is okay with the privacy film but I would be more concerned with the sound proof factor. If your looking to brighten up your hallway what about getting a door that has a full length mirror built in and have the mirror face into the hall way. In our bath our door swung in to the bath and took up precious room. We bought a new door from Lowe’s that had the mirror built right in and faced it out into the hall on a track like a barn door and we love it. It gave us more space in the bathroom and also makes the hallway much brighter. It might mimic the glass look you are hoping for. I have opaque glass doors throughout my home. I LOVE THEM! You will be living in your home 24/7 with visitors every so often. Design for yourself Kristi! I say go for it. For right now you would only be doing the bathroom door (and the others later) so you could use the bathroom door as sort of a trial to see if you are going to like it or if it will work. If not you haven’t lost too awfully much money and most likely could resell it. It’s your house you should do what you want! I’m thinking that frosted doors would look like the hallway in a medical clinic. Especially when factoring in the sound issue, I think it would feel uncomfortable for lots of people. Who wants to hear tinkling sounds (or worse) echoing around? Moms are usually right, and she is DEFINITELY right this time!! No way on God’s green earth would I feel comfortable using a bathroom with glass in the door…my bladder would just have to burst. I LOVE the glass doors! My sil has all solid doors in her house with the exception being her office. She loves it and wishes they had done all the doors! We looked at a house to buy that had French doors into the master bath, I LOVED them, no film either. Of course no one else would be using that particular bath most likely, but the owners had such beautiful tile, they didn’t want to hide in with a door. Go for it!!! Trust your instinct!!!! This is going to sound nuts, but I loved the detailing on your rolling doors. Why hot echo that design in all of the other doors in the house? It does not have to be the same as the rolling doors, but I know you can come up with something brilliant! I KNOW it will be a lot of work (ahem), but think of how it will look! We put frosted film on our downstairs bathroom door, top half is glass. Antiqued lettering was added to outside of glass, the non-frosted side. We love it. And we have had nothing but positive comments from others. Privacy has not been compromised either. I love your sense of style and your willingness to take risks, but I have stayed in many places with glass doors for bathrooms and bedrooms and overall I have felt exposed or been disturbed by light or noise. Glass panels in the bathroom door just don’t offer a great sound barrier, and while most of the time people will not be in your hallway-what about parties, family celebrations, or even the odd craftsman or two? Even with film on both sides, people still are able to see silhouettes and that just is no fun for anyone. I think the name of the game in bathrooms is anonymity-neither the person inside the bathroom nor the person outside of it should be aware of the other’s existence, like a force field of privacy. Absolutely yes for glass on your bedroom doors; it’ll let light into the hall. No, no, no! No privacy film, no frosted glass. Wood panel door for certain. Please listen to your mama on this one. I have had glass doors on both bedroom and bathroom doors since we built our house 23 years ago. Not once have I regretted it. Our hallway connecting to all of these rooms does not have windows. I wanted natural light as often as possible and the glass did the trick. As far as guests being uncomfortable….in my home guests are either family or friends, all of whom are indifferent to the glass doors. Maybe their just happy there are doors at all! Go for the glass. I think it will look beautiful with your future plans. I love the look, the only problem I have is that I’m very self-conscious using a bathroom that is close to a public area where people may be hanging out even with a wooden door. Can’t stand how the sound of “peeing” just seems to resonate and everyone knows what you are doing! If that’s not an issue, the privacy thing doesn’t bother me. No. Especially not for the style of house you have. Glass doors on powder rooms and bedrooms make me think of fake general stores, Disney and Pizza Inn’s. Tacky to say the least. The film is gross as well. Hmmm…the film is gross? I used it on my rolling glass doors, and it looks great! Looks just like frosted glass. “Gross” is the last thing on my mind when I look at those doors. LOVE the glass doors and I think you should go for them because they’re beautiful and because they’re what YOU really want. That’s what’s important in your forever home. If you and Matt are comfortable, that’s what’s important! I used privacy film in a bathroom shower window and it worked great. Go for it, two film layers will be fine. It might make me uncomfortable until I was inside, with a light on and reasonably able to see that vision was 100% impaired. Then I wouldn’t have a care in the world. And before I was using the bathroom, my decor loving self would be gleefully excited about the glass doors. Count me in the squad of people who furiously screencap shows or google image them to get inspiration photos from gorgeous sets. Yep. I’d love to see this on a dark door (or a hall of them)! I’d go for it. No, I would not feel comfortable using a bathroom or sleeping in a guest room with glass doors. No. I vote no for the glass door in the bathroom. That would make me feel very uncomfortable. However, it is your home so your choice. I think it LOOKS really pretty, but as a guest, I would feel TOTALLY uncomfortable. To me it is not really practical, but it’s your house! Love the glass with the privacy film…..!! Wouldn’t the film also mute sound? How about a door with the panels switched? The small panel at the top with glass to allow light and the bottom the large panel with solid wood? This would give you both the light and the privacy. I would not use a bathroom with glass doors. How about glass doors on an office, game room, or somewhere else? One writer stated we Americans are prudish if we don’t feel comfortable with a glass bathroom door. I beg to differ. Even though we all do the same thing, I’ve found that most people feel on display no matter how opaque the doors are, and they don’t want to broadcast bathroom sound effects. And, no, I don’t want unshaven armpits either because I think hair dangling there is unattractive. Different countries, different cultures. By the way, I’ve never seen a Miss Universe contestant with unshaven legs or armpits. I vote no half glass doors. Period. They look great in Layla’s old place but Layla’s style is cottage not modern/opulent. I live in a farmhouse and decorate in a mostly farmhouse style but I wouldn’t put a glass door in a place where privacy is normally expected. I don’t even let my partner come in the bathroom with me when it comes down to the business end of things. It’s just a place where privacy should prevail IMHO. But…it’s your house and you can sure do whatever makes you happy. I’ll never be stopping by so my opinion just doesn’t matter! Kristi, I love the 1 lite with the raised lower panel and think they would be gorgeous in black with double privacy film. I have no problem using a bathroom with a door like that. My reasoning? Well…I looked at how many times I’ve used the multi-stall bathrooms in Home Depot, Target, etc. and, really, your bathroom will afford far more privacy. And I don’t have any reason to care if someone sees light on in my room and knows I’m not sleeping. The average bedroom door does not afford much sound privacy unless you’ve invested in some serious doors…ask any parent who’s listened outside their child’s room to find out if they were asleep or playing. So that’s my vote and my logic! Solid door for sound and privacy. Go for it….. it is your house. And it would not bother me a bit. You were asking earlier about soundproofing the wall that shared with the music room. Glass would allow the sound to travel. Then there is the possibility of shadows. With all the wainscoting you’re doing a solid door would be better. Glass doors I think would make your rolling doors less special. Black & then work your magic with trim to have one of a kind doors. I love the idea of a glass door. Go for it! It’s your house! I’ve lived places with glass in the bathroom door ,not a fan. Even when you know no one can see in, it just isn’t private enough, let alone the noise factor. I know it’s only you and Matt, so those issues may not bother you. I vote for the frosted privacy glass! Though some people may feel like they’re on display, you might be able to fo something simple, like have small curtains on a rod attached to the door. I vote for the glass door. I want one in my house too! GO FOR IT!!!!!!!! While I think it would look neat, I would probably ask to use the master bathroom. At least that door would lead to a private bedroom and not a hallway. Anything less than 100% privacy is just not appealing to me in a bathroom. GO FOR IT!!!! It is beautiful and yes, I’d use your bathroom in a heartbeat!! It’s your house, you use whatever door YOU like. Personally, I would have NO qualms using a bathroom or any room with privacy film….as you say, it IS private and the film DOES do what it’s supposed to do. I think it also will make your house even brighter as any light from the interior room windows will shine thru and create more light. It also sounds as if you truly have your heart set on a glass door, so I say GO FOR IT!!!!!!!!! My first answer was to go with the frosted. (Light is a must for me!!) However, after seeing some other comments I like the idea of some of both with all doors being black. Every time we see a movie or TV show with glass doors on the bath or bedrooms, my husbands always says….who would glass on the bathroom door? I think they are pretty, but I would never use them on bed or bath. It’s kind of like some bad dreams I’ve had, you know, being naked at a party. LOL! I would worry about the sounds as well. I, too, thought about the sound-proofing being less with glass than a solid/wood door. But I love the look! 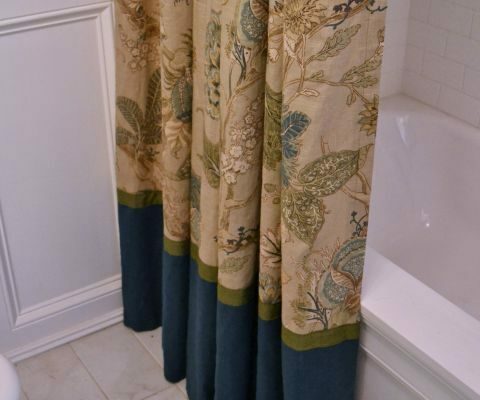 Perhaps you could install a decorative roller shade on the inside of the door for those who are uncomfortable…they could pull it down if desired. My doors all french glass bedrooms and bathrooms. I love them. If you want them go for it. You need to do this for you, not for everyone else. They will get used to them and it will be second nature and anyway it’s mostly just you and Mat. Occasionally company. So why worry about it just do it, it;s your dream house. we have frosted ribbed glass on our bedroom and master bathroom doors. I don’t mind it at all, but then again no one is waiting in line to use it while I’m in there. I’m used to it, but I just might “go” faster at your house in case someone is watching me. Make a sign that says no one can see you and go for whatever door you want. Frosted glass door looks too commercial. They remind me of the doors in an Italian restaurant! Why be so consumed with closed doors? The bedroom doors in my home are never closed unless we have overnight guests which is rare. I agree with patricia smith….use an optional shade inside. I like the look of the glass doors, but personally would feel more comfortable if I could pull the shade down when in use. I think a solar tube for the hall area would be the same price as all those custom glass doors and give better natural light! I add my concern to others that pointed out the problem of heavy wheelchairs and fragile glass, not always a good mix. Ask Matt what he thinks and then do what you both agree on, it will look great no matter what. Good luck with your choice, it cracks me up how many people chimed in so vehemently on this topic! Good point about th wheelchair. Also, my friend put in tubular sky lights- I was amazed the amount of light that they brought in! Who asked you people anyways (except for those of you who love the glass French door)????? And who listens to their mom? They give terrible advice and her cooking’s probably going downhill too. Well now you absolutely HAVE TO go with the French door. You will forever kick yourself if you don’t. Chop Chop….I need to see how those doors turn out! Can’t wait! I think the glass door looks rather ‘country’ or ‘cottagey’, which is not the look you are heading towards in your house. I vote for the glass doors. Personally I’d prefer the door to have mullions rather than a solid pane (which might also make those bothered by glass feel less vulnerable). I like the that any natural light in one room can travel thru the glass& film. As long as you can’t see anything when you look in I can’t see a problem? That’s just me. 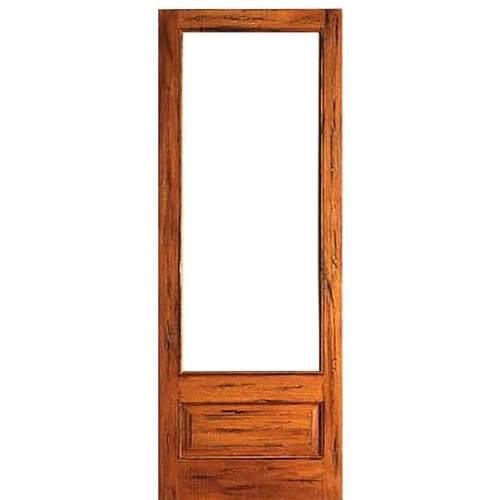 I plan to put a mullioned french door on my back half-bath once it’s better framed in and use an antique window repurposed from another part of the house to fill the wall area…with privacy film, of course. Kristi, I vote for glass doors! I love them! I love both your choices, but in answer to your question, no I wouldn’t feel uncomfortable. Go with the glass and put a pretty bucket down the end of the yard for those that don’t like the idea of a glass door. Except your Mum…. No-one should send there Mum outside to pee. G’day! I read your proposal and thought: yikes glass inset doors! Started reading the comments and then realised that I have just the same thing myself! I have sliding Japanese shoji screen doors (made from plastic type sheeting in Australia though) into one bathroom and frosted glass French doors into the other! They work like a breeze … letting light into the foyer areas. Enjoy! And after 15 years you will actually forget that you have installed them, if I am anything to go by! My aunt and uncle have a full frosted glass panel on their bathroom door that guests use (though they live in FL and theirs is etched with a dolphin design that I absolutely hate.) I’ve never felt on display not have I ever been able to see anything when the bathroom was in use. I never heard sound from coming from inside the bathroom when in use either, but then again, I wasn’t hanging out in the hallway by that bathroom door either. There are some compelling reasons for and against already on here. Both options would be beautiful so in the end you can’t lose with either. Glass certainly has the wow factor though. Rambling Renovators has a glass bathroom door and it’s her main bathroom. Maybe reach out to get Jenn’s thoughts on living with the glass door to help with your decision. I haven’t read most of these responses. So, if other people have said this, already, forgive me. How often will the doors be closed? Do you leave bedroom doors closed all the time? Or do you usually leave them open unless there is someone in the room who is needing privacy? If your doors are typically open…it might not matter whether they are black or frosted glass. Just a thought. I love everything that you do. I know that you will make it all look amazing. My personal preference would be a solid wood door. How is the weight loss? On R2 for me. I do love the look & think it would open up that area & create more light. My grandparents had a door on their bathroom that had glass & 2 things would happen. You could see the shadow of the person in there when the hall was dark & you could hear a lot more then through a solid door. I always felt uncomfortable showering in there when other relatives were staying there because it just didn’t feel private. At our previous house, our guest bathroom had a frosted glass door. It made guests uncomfortable, to the point that they would ask for a towel, or curtain to hang over the window. 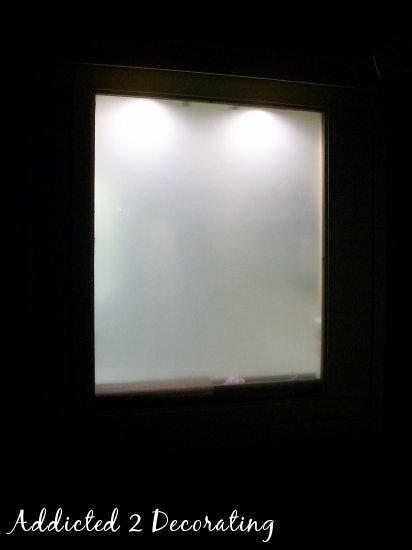 My neighbor has frosted glass for his shower window and I can see his movements. Can I just say, TMI, TMI, TMI?!!!! We have a frosted window in our bathroom and I love the extra light and how elegant it looks. The frosted glass windows would give your home a lot of character. I love the idea. I would’t give the whole privacy issue a second thought. No one can see in with frosted glass and as you mentioned it’s in a hallway. Go for it! I meant to say the frosted glass doors, would give your home a lot of character. Do it! I’m obsessed with glass doors in bathrooms! Glass door for a bathroom…..Ew!!!. We will put french doors in the bathroom in the master bedroom, but I wouldnt do it on bedroom doors or any other bathrrom. It looks like an office. A few people have talked about transoms- now that’s a look I love. Doors are expensive so I hope you are happy with whatever you decide. I’d feel a bit exposed if I had to use a bathroom (which I have) with glass even if frosted. I’d be concerned about shadows cast plus I agree that the glass door is a bit too casual for the style you’ve chosen for your home. Would be better as pantry door, but if you are determined to use it …consider an etched glass to dress it up. Hope this helps. I just finished watching a re-run episode of The Big Bang Theory and noticed the bathroom door in Sheldon and Leonard’s apartment has a mostly glass door. Just thought I’d mention in case you wanted to check it out. After reading a lot of the comments you’ve received, I realize what a hard decision you have on your hands. Kristi, I think this has probably elicited more replies than any other question you’ve ever posed to your readers! But I have to give just one more: Several people have opined that it’s your house, and you should have whatever you want in it. Normally, this is my own decorating philosophy. Some have also stated that if people don’t feel comfortable with glass doors, they don’t have to come back, or they should use the restroom before going to your house. This is where my opinion changes from my usual decorating philosophy. My friends don’t have to like my decorating style, but I do want them to feel comfortable when they visit. I value my friends, as I’m sure you do, and I don’t want them either to stay away or dread coming here. In your case, one of the people who’ll be uncomfortable with glass doors is your own mother! I read one suggestion about installing shades over the glass in the bathroom. I think that sounds like a possible solution, especially if you do lined Roman shades. The double thickness of fabric might also add to the soundproofing of the glass. Then you’d have the glass you like, and your visitors–including your mother–will feel comfortable in your home. I hope you are going with the glass doors. It will be so lovely! As for privacy, the privacy film takes care of that. As for noise, the vent fan will take care of that. My current guest toilet has a solid wood door, but do to the space at the bottom of the door, without the vent fan on, you can hear everything that goes on in there!! Your visitors will quickly come to know they have full privacy on both fronts. And they will love the look as well! go for it!! I say go for the glass if that is what will make you happy and fulfil your vision. I had French doors on two of my bathroom doors and one bedroom door in our last house and no one felt uncomfortable using those rooms. We always had loads of guests. What I did was put sheers on the inside of the doors and that provided both visual and sound privacy. And it looked lovely and was different to everyone else’s house. Go for the glass!! I have a 3 panel door with glass in the top panel (frosted) for my bathroom door and a full frosted glass door in between my laundry and bathroom. I also used a large piece of frosted glass to act as a floor to ceiling room divider by the toilet. I love that its a little out of the ordinary and we have had no privacy issues. I say do what makes you happy! It’s your house!! I don’t get the issue. If your guests are standing in front of the door, can’t they tell for themselves that it isn’t see through?? As for noise, I think you’d have to have your head pressed up to it to hear anything and who does that?? I have all black one light double laminated doors throughout my home. Its a more modern look and not for everyone but I personally love it. Much more interesting than boring white six panel hollow core door that almost everyone else has. Go with your instinct and your own vision. There is nothing wrong with the idea of a glass door. Some people are prudish no matter what you do and some can’t see outside the box. Frosted glass doors are common in Europe. Glass will provide more light and will look stylish. I remember going to a friend’s home who was a DIY’er and he had replaced an entire wall with floor to ceiling glass, and that was clear glass looking out onto his yard. The yard did have a very steep hillside and wasn’t visible to anyone and he had planted the area so that you felt like you were doing your business in the garden. It looked awesome..felt a bit weird at first but you soon get used to it. Your idea is mild compared to that. Do NOT take your mum’s advice when it comes to decorating your home…that is a big no no. 😉 One layer should be enough. I just stumbled upon this and realize I’m a full year past the last comment late to the party, but… I love the glass on the bathroom door idea. That’s how I got here. I was looking up frosted glass privacy doors for bathrooms! We have privacy film on a number of exterior facing windows of our home, and like you, we’ve tested it pretty extensively. It’s very, very effective even at night. I think having the bathroom with the glass door would open up the space and allow light to pass out into the hallway, brightening the whole zone of the house. Bedrooms I’m not sold on because you go into a bedroom to stay there for a while, to sleep, to snuggle with your spouse (cough), and quite frankly a full on door is more suited for that kind of room. Bathrooms are not rooms you camp out in and tend to be the smaller, or smallest, areas of the house. Glass is a great option to help with that. I’m really curious if you did it and how you like it! I actually ended up using solid doors. I kind of regret it at times. I wish I had just gone with what I love (the door with glass), but some of the comments on this post scared me away from that decision.